Hope everyone's week has been going well! I have a really exciting update about my living room! We moved in our house over a year ago. At the time we purchased this sectional chair that fits perfect in this little nook. We updated the space with some decor such as the photo gallery wall and the mirror you see. We also ended up buying our round glass table and the laptop table at IKEA earlier this year. On the other side of the living room, you can see that we have our TV, TV bench and the brown chair (Which I greatly dislike!). 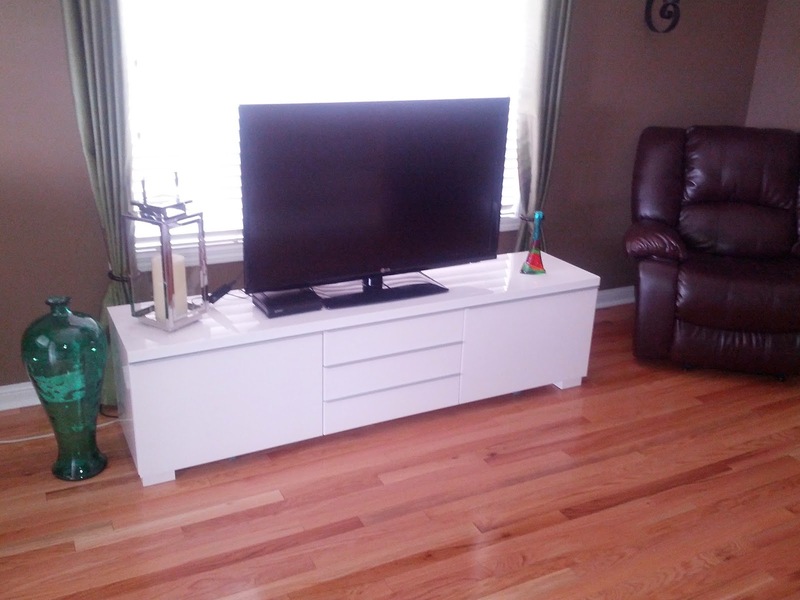 We got the TV bench from IKEA earlier this year with some of the accent pieces from Home Sense. And that brown chair? Well, when we first moved, we used our old living room chair set which was brown and leather (like the chair). 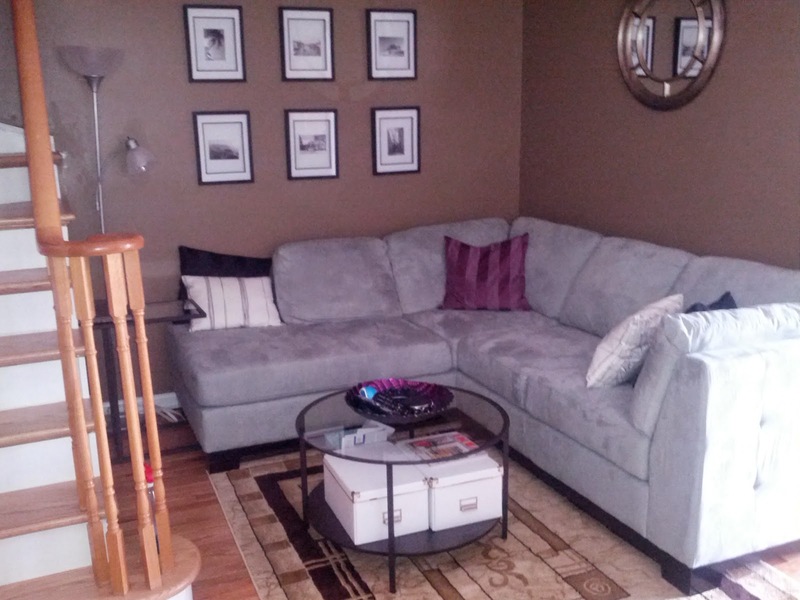 When we got our sectional, we ended up moving the loveseat and sofa to the basement as it just wasn't working for the space (& me) and ended up leaving the brown chair in the corner as we had no idea what to do with the space. For the past year, I've been looking around and deciding on what I should do. 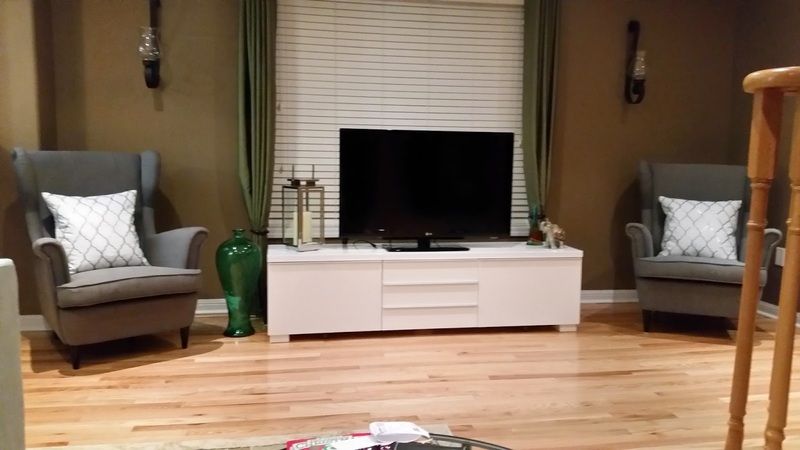 I settled on getting a pair of accent chairs to put on either side of the TV bench. I have been looking everywhere for the past year to find a chair that's comfortable, affordable, trendy, versatile and something I would really like, since I want to have this chair for a very long time, and in a colour and style that would fit in any room. I did A LOT of researching at multiple stores to find the 'perfect' chair, but every one I looked at just didn't fit my style until I found out about the wing chair style. I really like the look of these chairs, they're very elegant and classy. I then focused my search towards other stores with chairs in that particular style, but I found that the prices in most stores were crazy high! Finally, I had set my eyes on IKEA's Strandmon chair, after a year of fruitless searching. What made this chair worth it compared to other stores is that IKEA usually has a sofa event during the year in that when you buy one fabric armchair, sofa or loveseat, you get the second 50% off, so I decided I would put some money away every month to afford the two chairs when the sale returns. Finally, IKEA had its sofa event (The sale goes on until Nov. 24, 2014), and I seized the opportunity! It's obvious that no other chair suited my tastes, so I indulged! As I mentioned before, I did put away money every month to save up for these chairs, and let me tell you -- it's totally worth it! I got them delivered and set up last week (if you follow me on Instagram, there's a picture of the chairs still in the box). Ever since then, I've been in love with my chairs and the living room! I can't get enough of it! Every time I come home and walk into my living room, I fall in love with it all over again! The chairs make the space complete, cozy and warm and I couldn't be happier with my purchase! I decided to get the chairs in grey, since the colour's neutral and it goes with just about anything. I picked up the white accent pillows from Home Sense. I like them for the design and white is a very versatile shade, which comes in handy in case I ever wanted to use the throw pillows for another purpose or in another space. I'm absolutely loving the space and the chairs! I just can't get enough of them. What's your favourite space at your place?